Frankly, Uncle Leopold, I was shocked by revelations in last week's episode of Victoria on PBS. 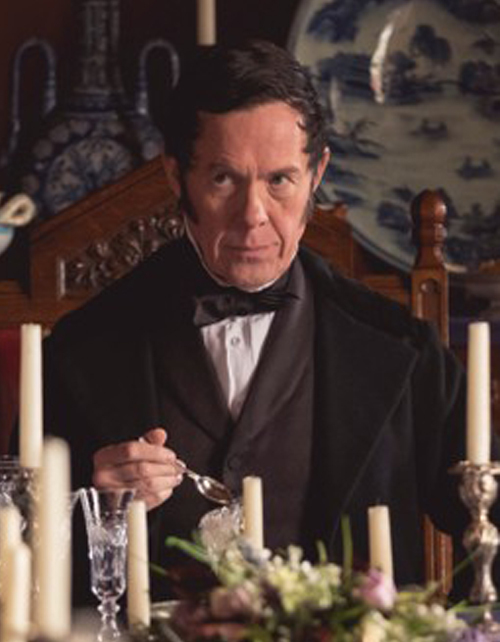 He's playing it a bit diabolically for my taste, though. And I remember his first marriage to Victoria's cousin, Charlotte Princess of Wales. 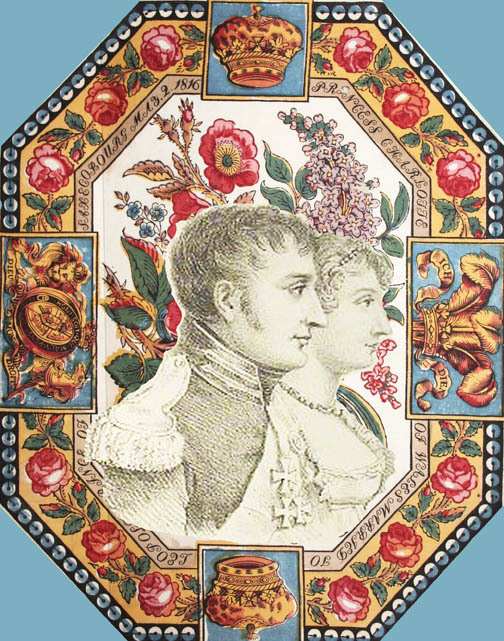 Leopold would have had the same position as Albert as husband to the Queen of England had Charlotte not died in childbirth at 21 years old only 17 months after her marriage. 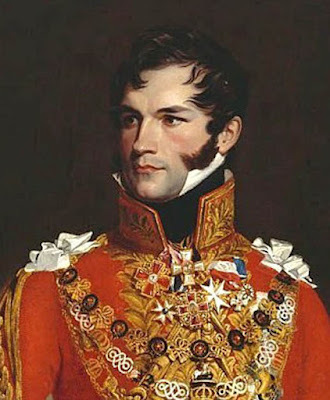 His second wife Louise Marie of Orléans was French royalty. 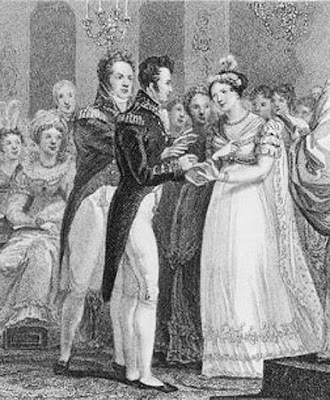 He knew how to parlay marriages into dynasties. "I marry the best of all I have seen and that is some satisfaction,"
wrote his fiancee who had broken one engagement. As cute as Lord M., don't you think? 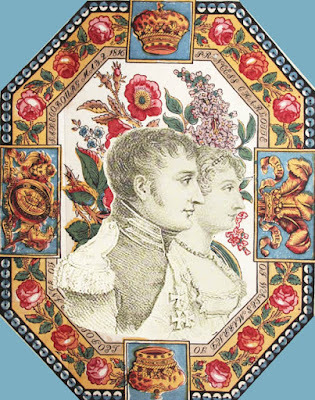 printed to celebrate the Charlotte/Leopold marriage. 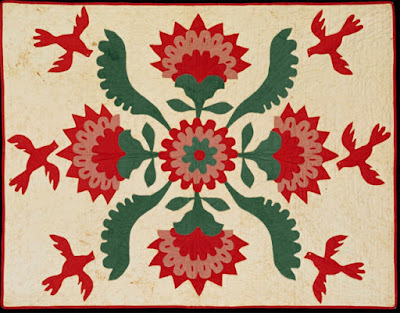 to Leopold Prince of Saxe Cobourg May 2, 1816"
Pheasants and Portuguese stripes in the border. 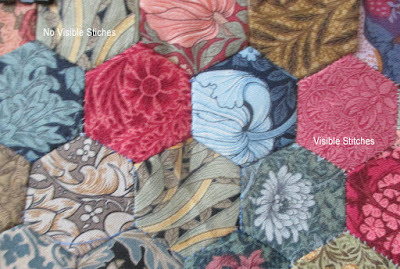 This looks quilted with no batting. the collection of the Victoria & Albert Museum. 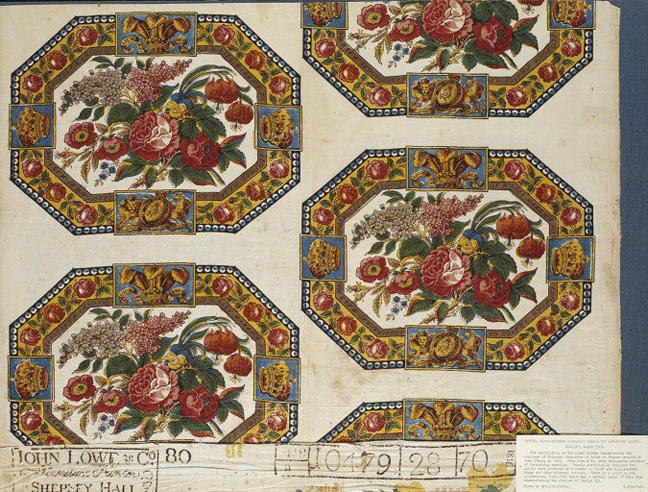 John Lowe and Co. Furniture Printers, Shepley Hall. Here's one that looks quite British, sold at Tennant's Auctions last year. 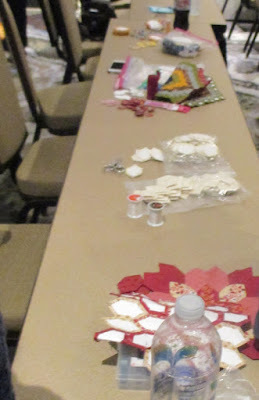 Hearts are a nice addition. ago at Christies in London. The late Doreen Speckmann used to give a lecture in which she entertained us with photos of Anorexic Applique. I still save photos, thinking of her. 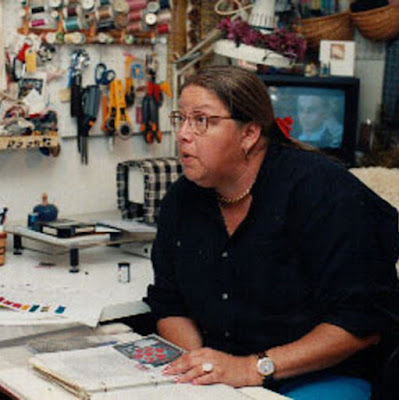 Here's a little show to remember Doreen. 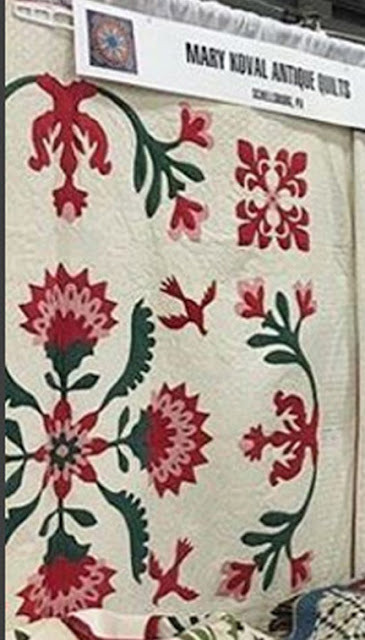 Was there more to this design at one time? 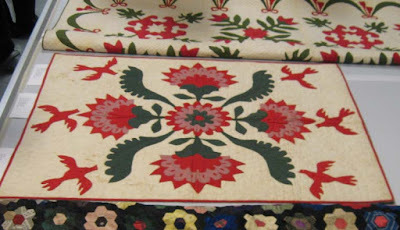 a visit to Colonial Williamsburg. 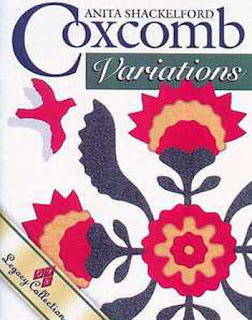 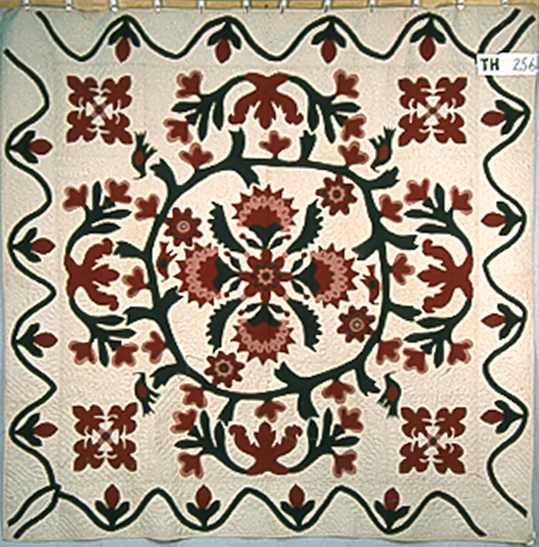 Tulip Cross Crib Quilt 45-1/2" x 35-1/2"
Member of the Richter Family, Ripley County, Indiana. 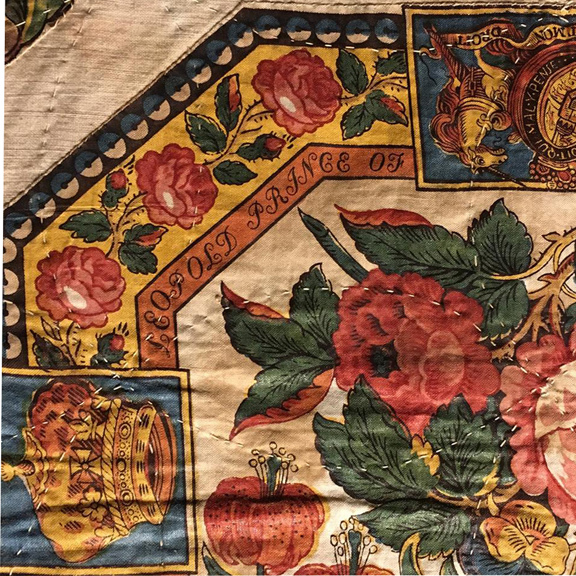 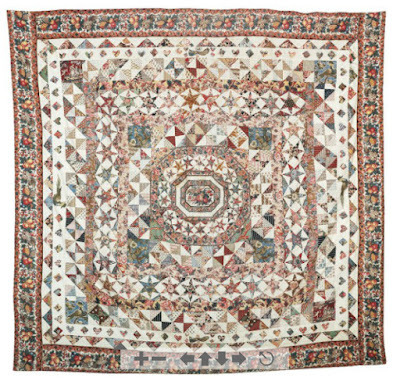 A few months ago I saw another version of the same pattern in Julie Silber's stack of antique quilts for sale at the American Quilt Study Group in New Hampshire. 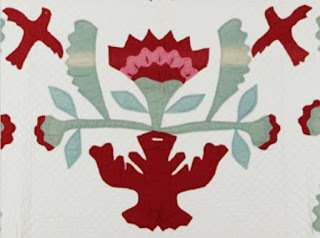 thing it was gone. Sold to a happy collector. 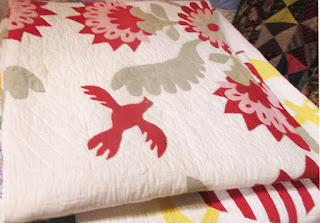 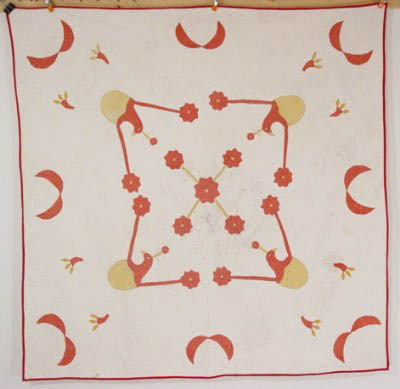 I have photos of several quilts in the same pattern in a file. 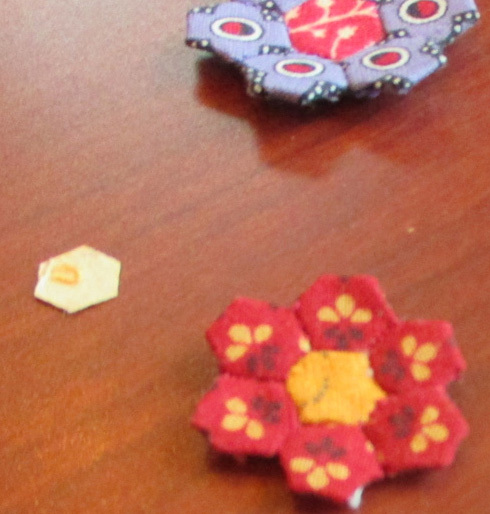 one's more delicate and missing some parts. I mention the strong greens because several versions like this one sold at Cowan's Auctions were stitched with the fugitive greens so common after 1880. Those leaves and stems were probably once a dark green with a touch of blue but the early synthetic dyes faded badly. So I am guessing this one is after 1880. 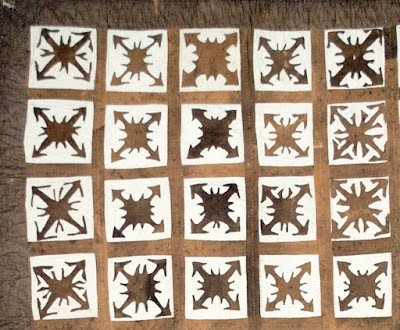 Fading to tan where it was folded and exposed to light. 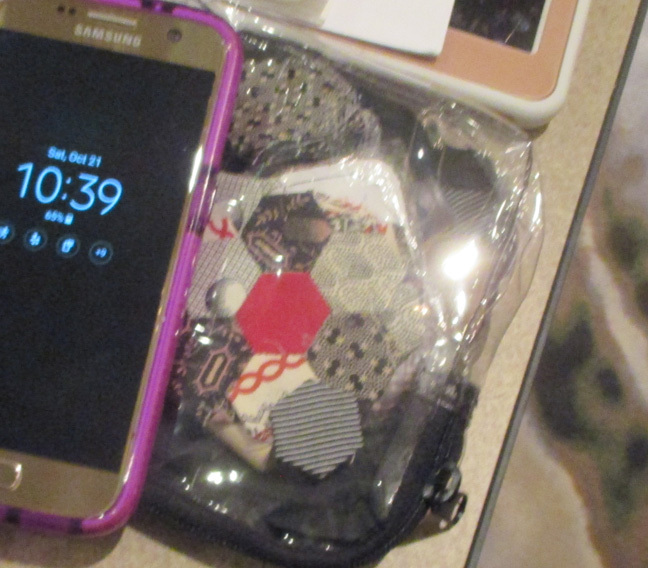 but that's all they know. The pale scallop on the left was once dark green I bet. 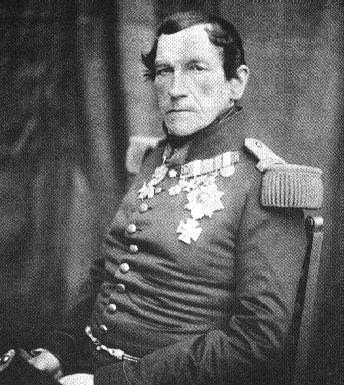 1850 to about 1900. 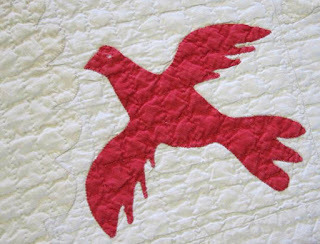 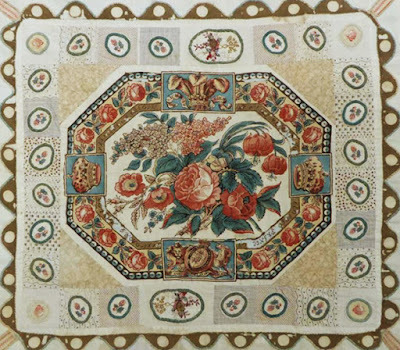 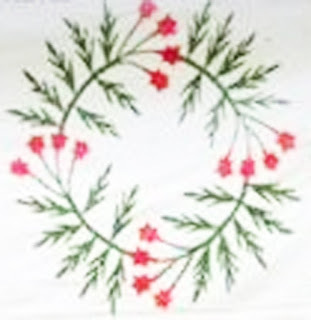 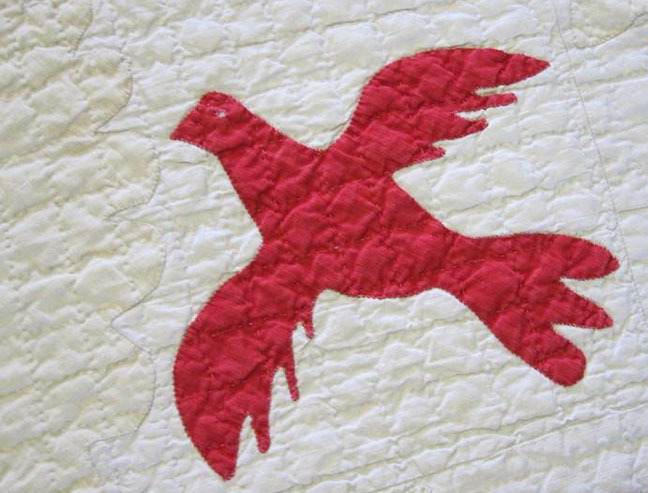 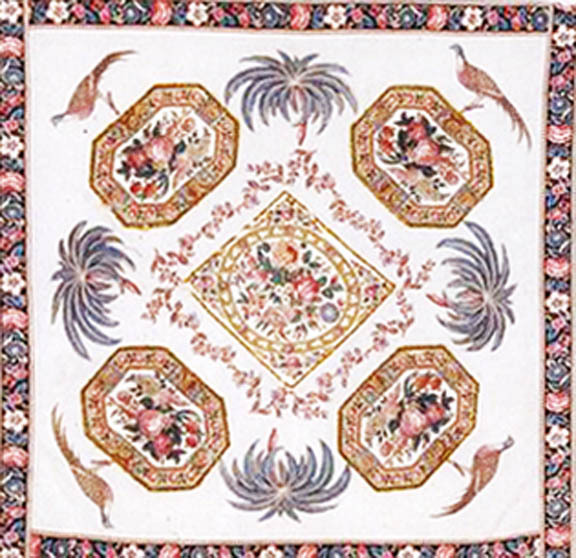 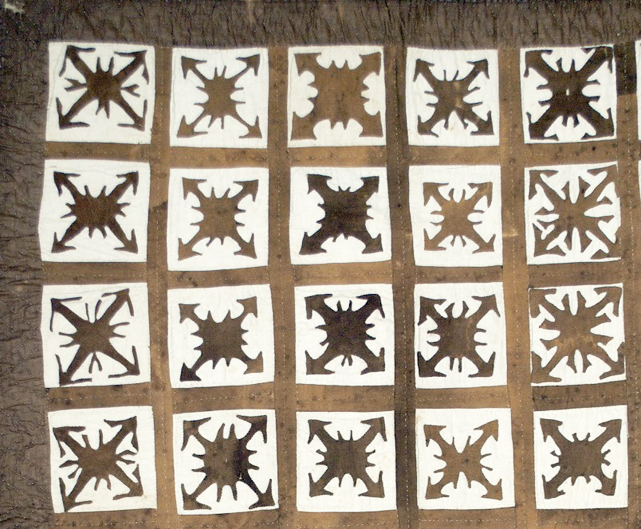 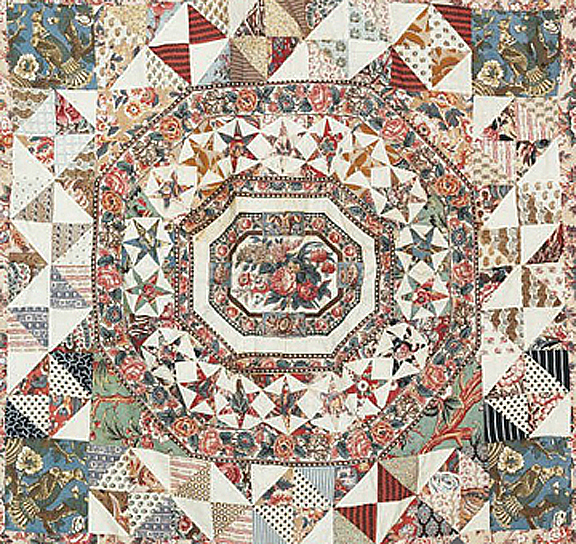 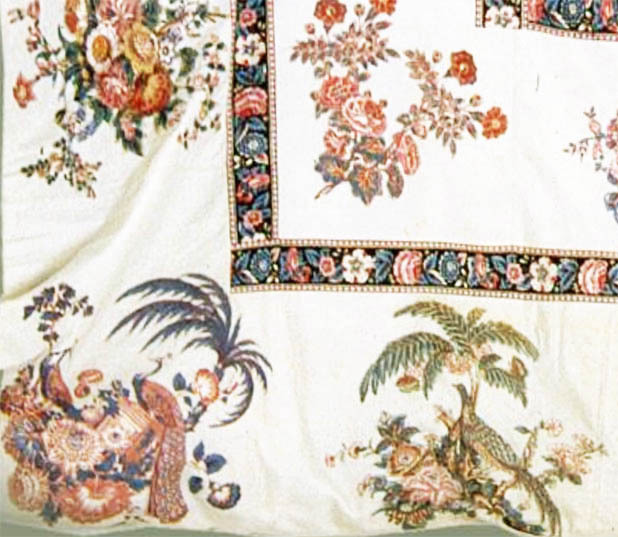 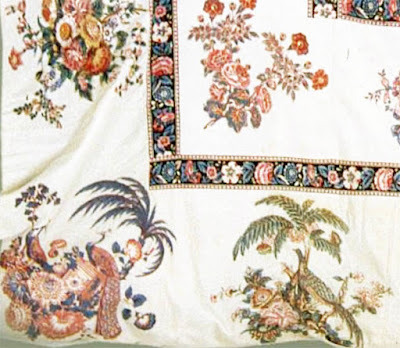 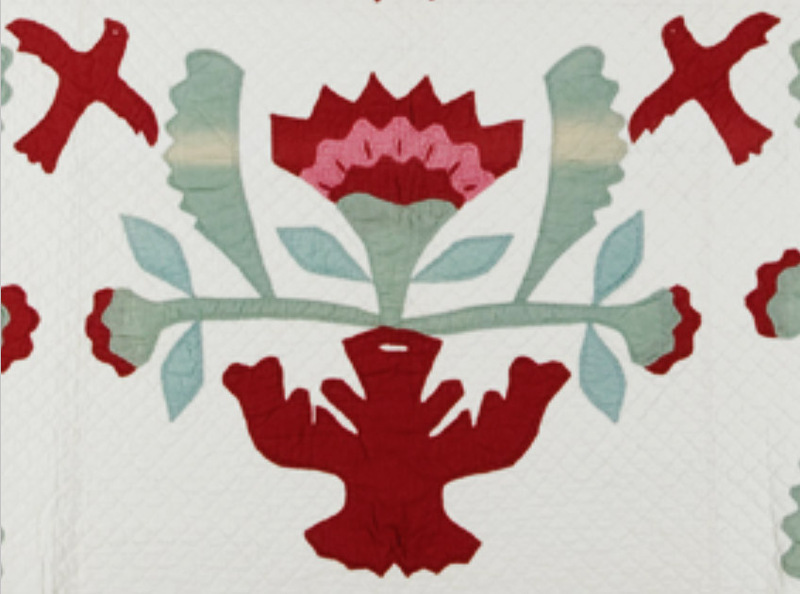 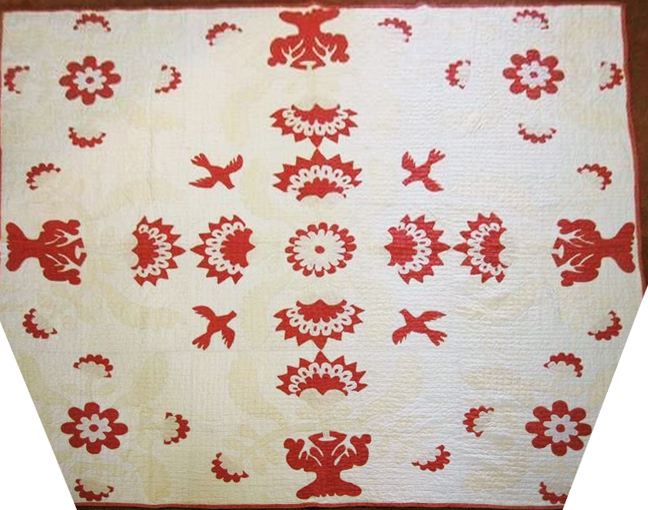 It was often the center of a nine-block applique quilt of three different designs. 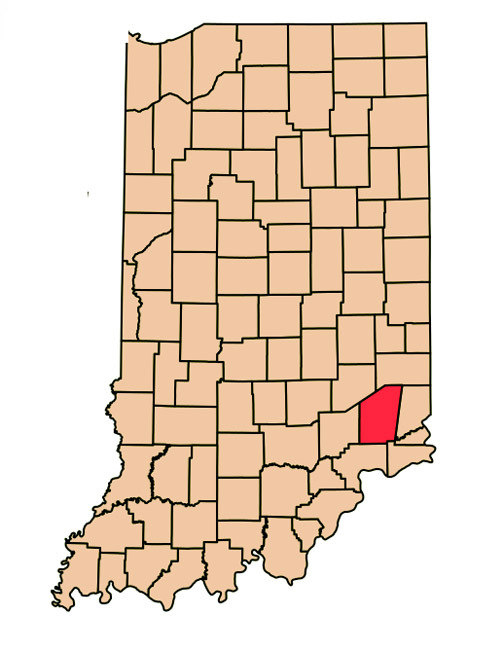 I'd guess that region was Indiana. 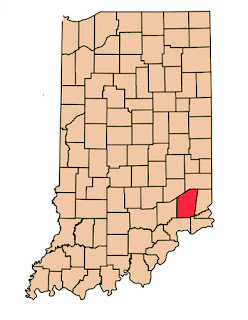 west of the state of Ohio. and make one of your own. 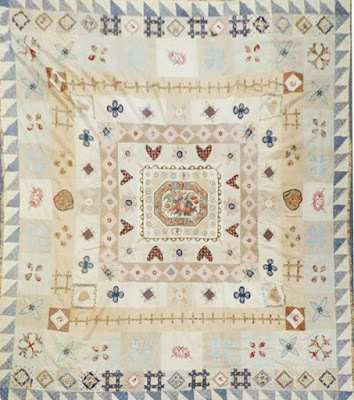 Anita owns the antique quilt she used for inspiration. The caption gives us a good deal of information. 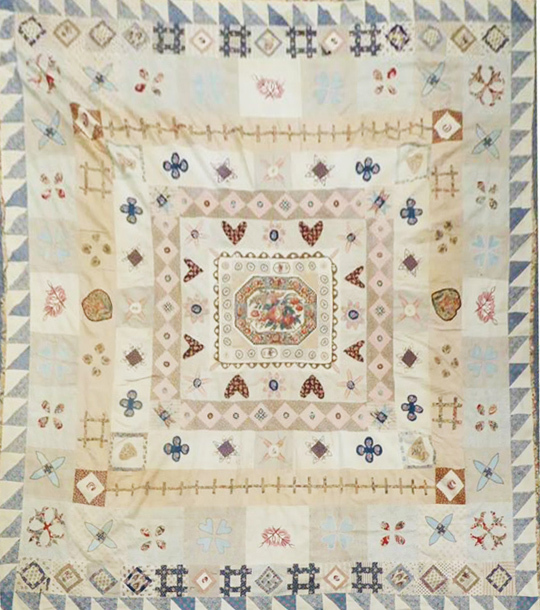 "According to Don Walters, the dealer who sold the quilt, the quilt can be attributed to Alma Richter. 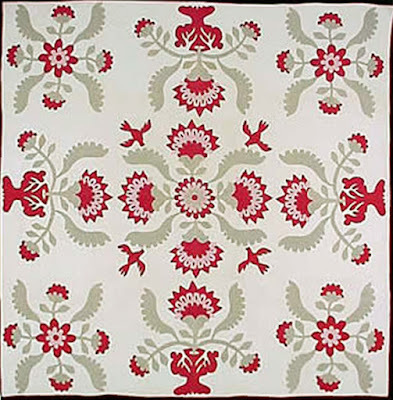 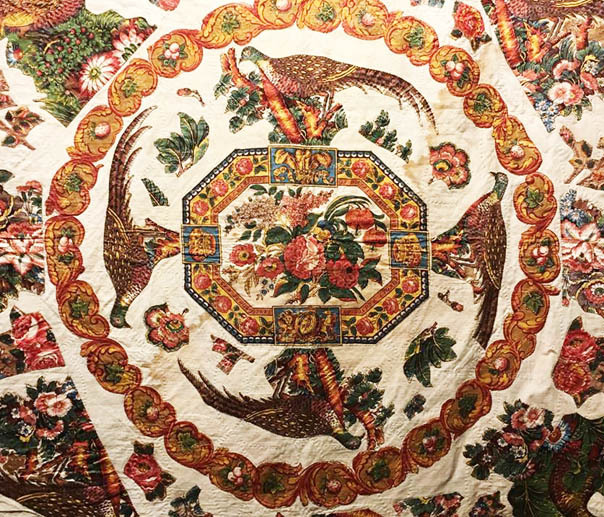 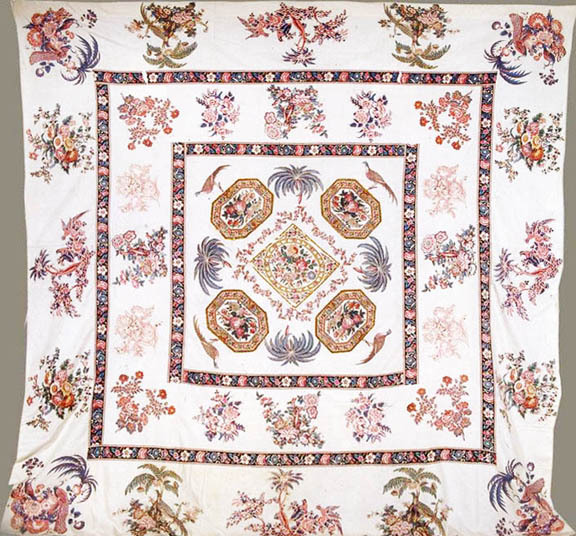 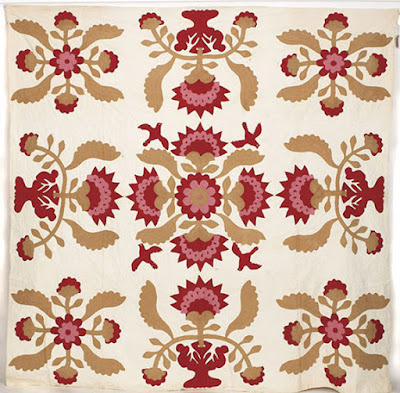 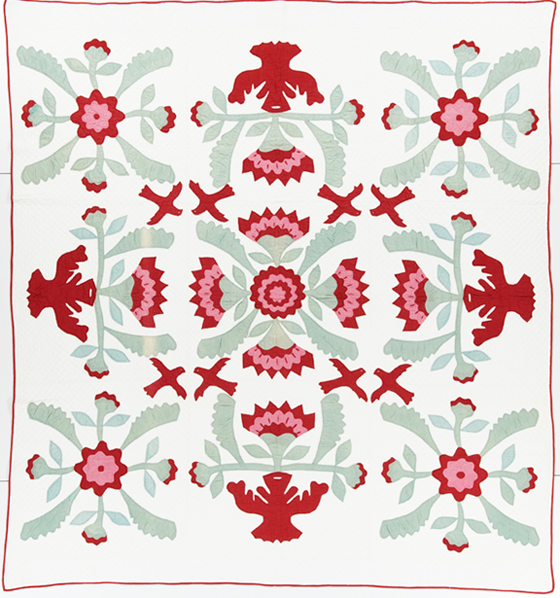 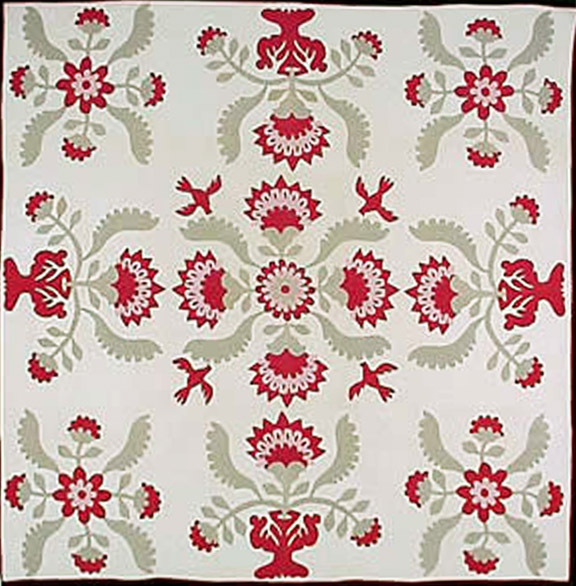 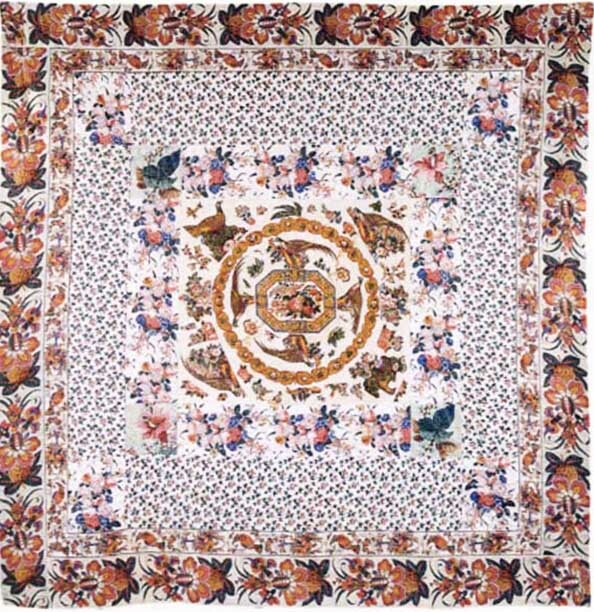 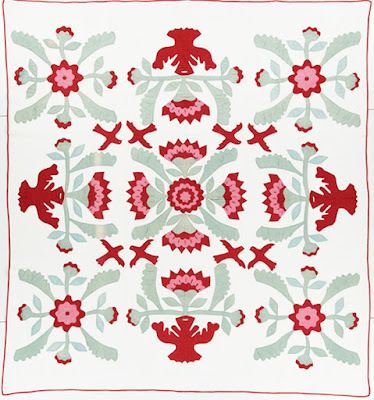 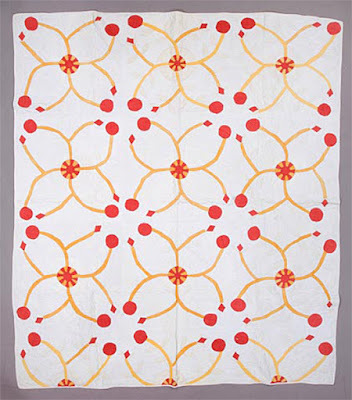 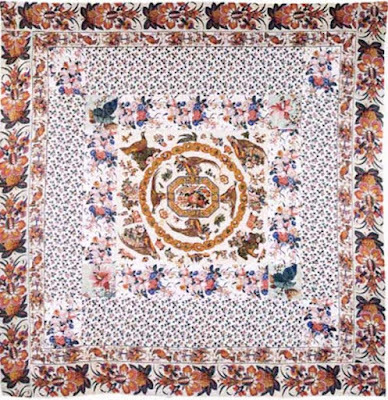 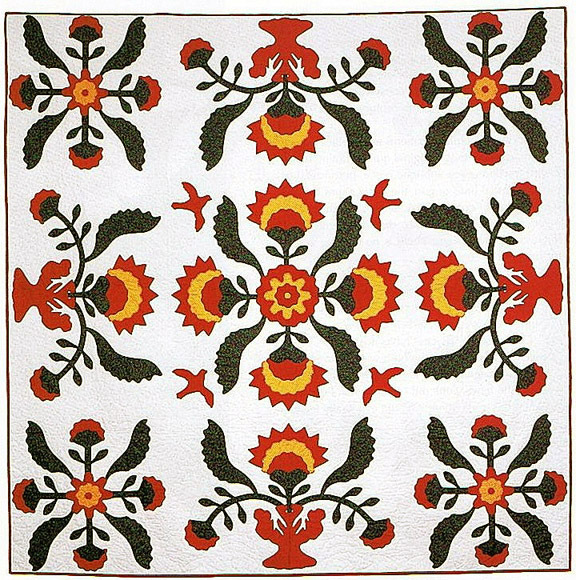 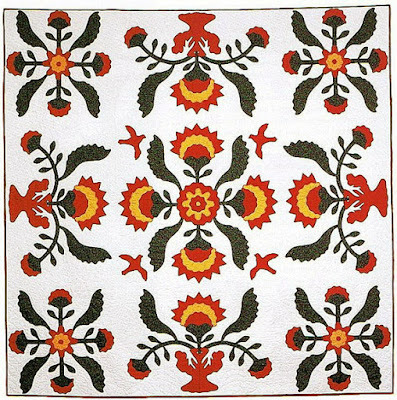 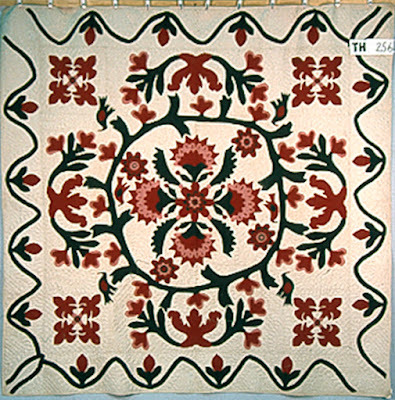 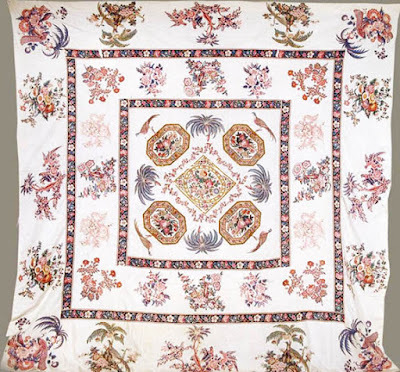 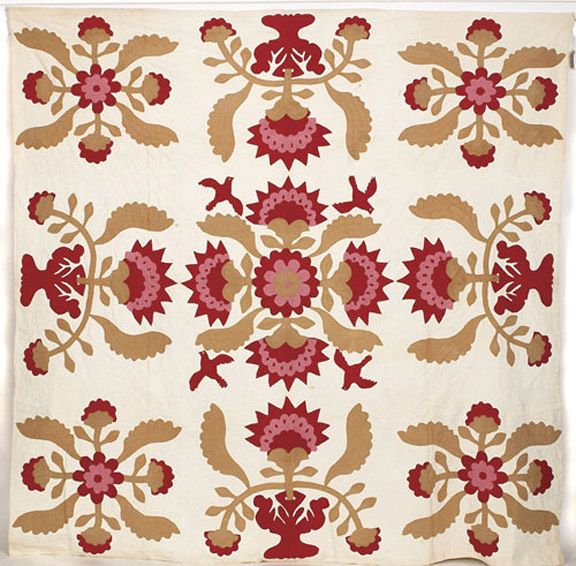 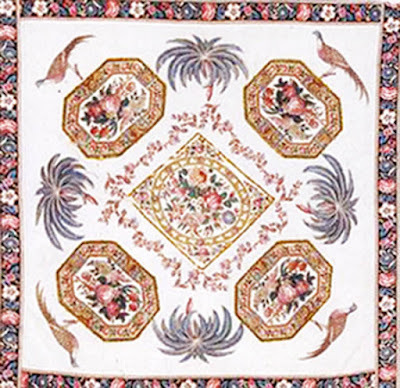 Another quilt in a similar pattern (in a private collection in the 1980s) was also said to be made by Alma Richter in 1854. 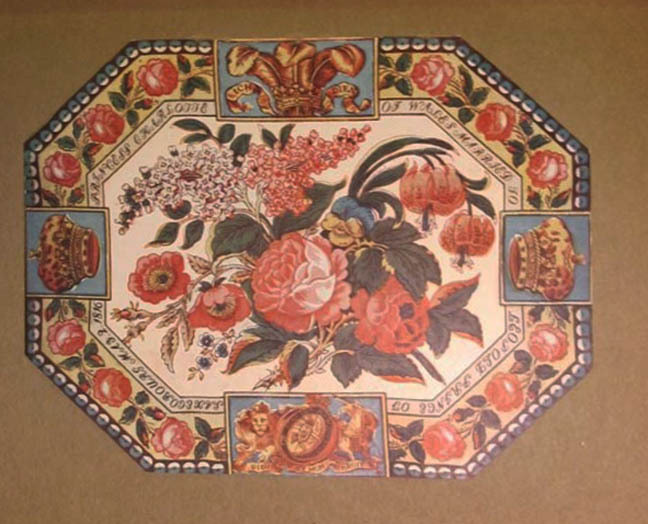 A search of Ripley County, Indiana, records failed to locate an Alma Richter around that date. 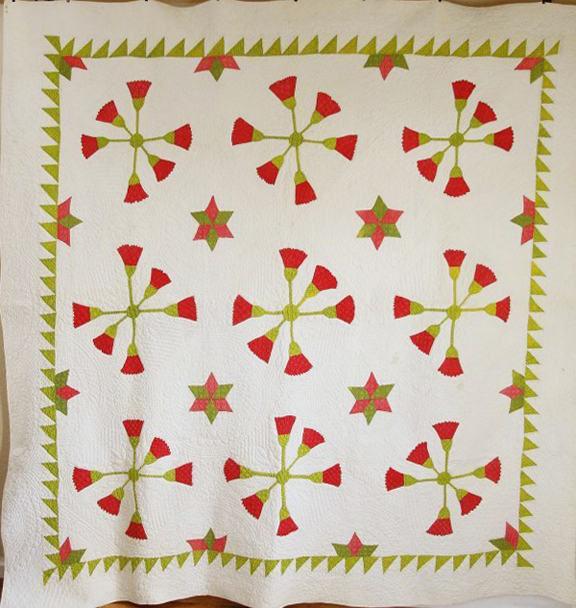 However, one Alma Richter, 1898-1984, had a German-born Grandmother who lived with her family in Ripley County, Indiana. The Grandmother Anna Richter was a widow who was born in Germany in 1814 and immigrated to the United States in 1841. 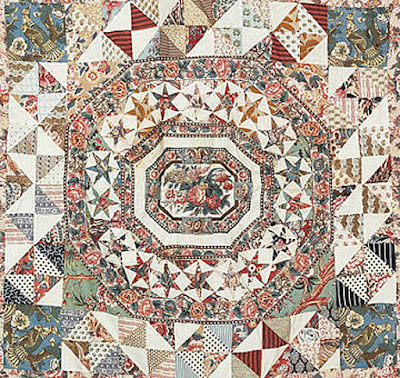 Anna Richter may be the real maker of the quilt. 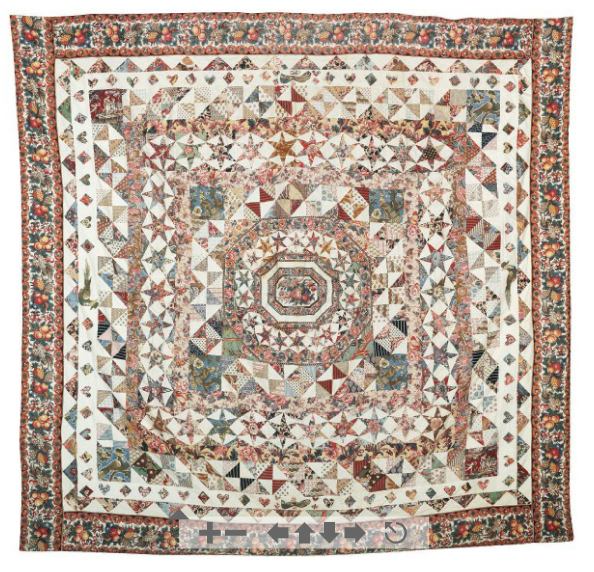 It appears that the woman whose estate was sold in 1985, Alma, may have been mistakenly credited with making the quilt. 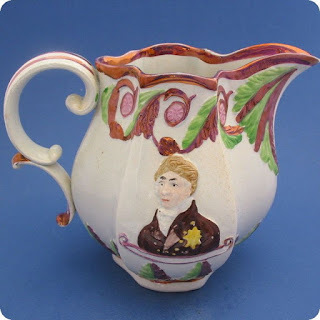 It is unclear where the 1854 date came from." 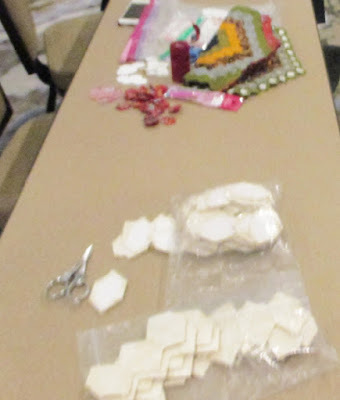 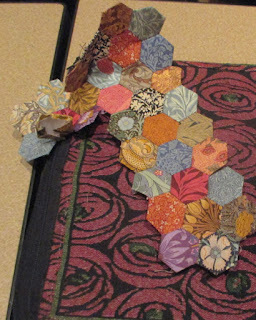 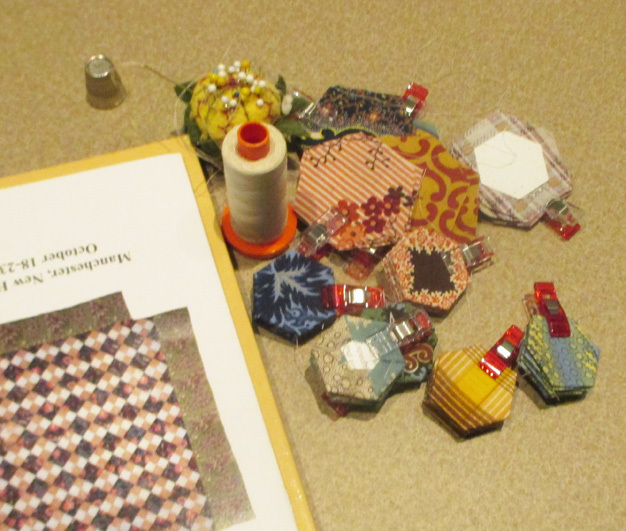 I was surprised to see how many of us at the American Quilt Study Group Seminar last fall in New Hampshire brought our paper piecing. 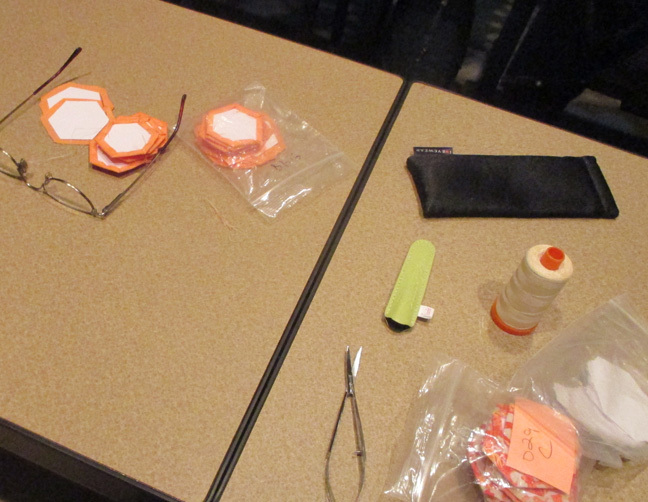 During the three days of lectures many listeners pulled out their very portable projects. paper pieced shapes. 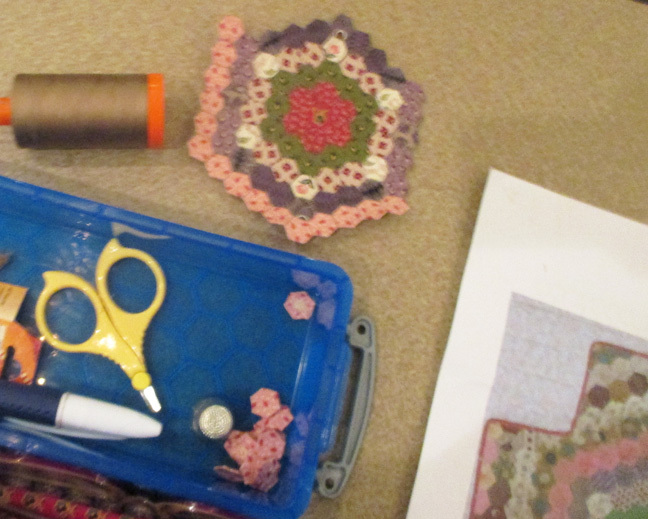 I always face the pieces together to sew and the stitches show. from the back. 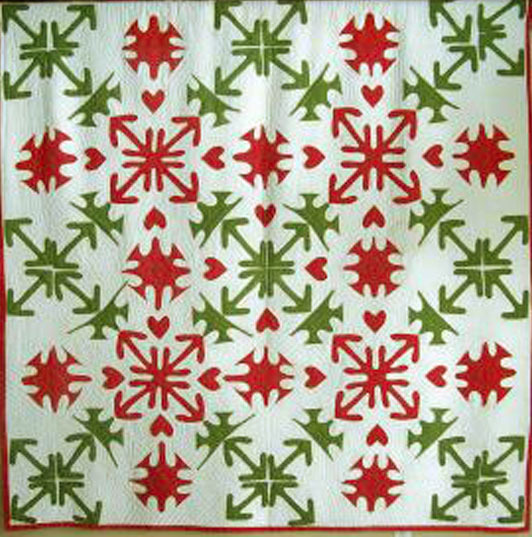 No visible stitches. 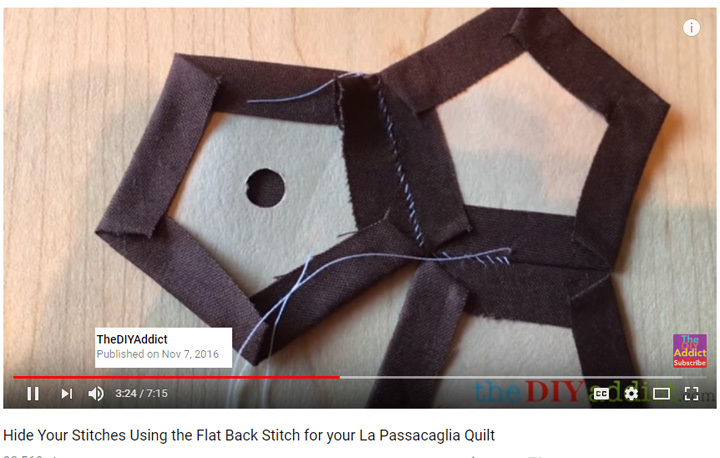 I tried it and it works wells. 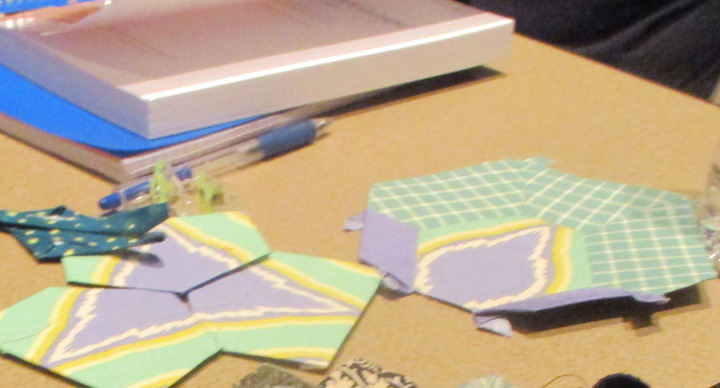 keep flipping the pieces over. 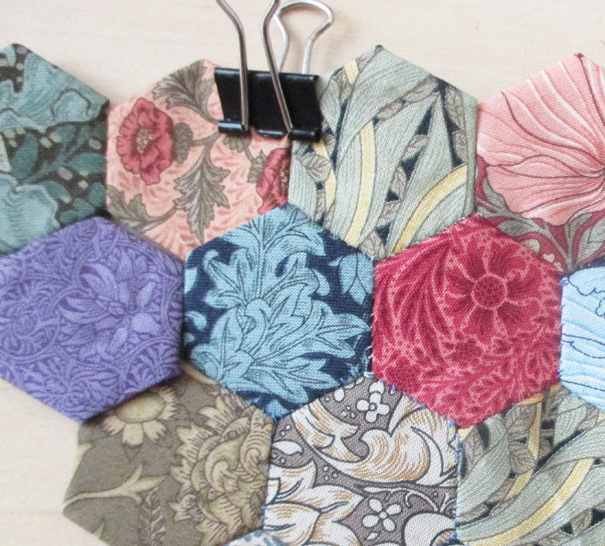 I'm still working on this one----3/4 inch sides in William Morris repro prints.